Two slightly overlapping upper petals, two side petals, and a single bottom petal with a slight “beard” emanating from the flower's center. The center of the flower is often darker or differently colored. The petals are somewhat bland, but if you eat the whole flower you get more taste. Use as garnish on salads, soup or deserts. 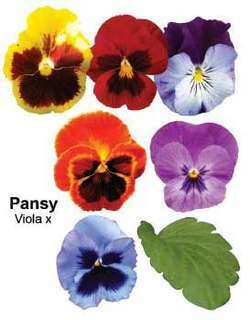 If you are beginning to get more interested in growing pansies then consider having a look at some of these varieties. Since I was a kid, I have always treasured pansies with blotches. Nowadays, pansies come in a vast array of colors, and because they seem to be rather ubiquitous, we tend to think of them as being ordinary and take them for granted. Pancreatic Cancer Alliance volunteers will deliver the pansies the week of April 7Co11. Pinks, Pansies, and Punks discusses these implications in works by numerous literary figures, including James M.
One fault of pansies is a tendency to legginess especially in warm weather. 2 Instead of a traditional window box, if you have enough of a ledge on your windowsill, replace the oblong container with a regimented row of smaller matching pots filled with primulas or pansies to make a statement. pansies by the road as Mother and I walked you to school. and filled my car (pretty much full of pansies really), it was time to feast and fill my belly. Deadhead pansies, primulas and other spring bedding plants. I find delicate pansies and zucchini flowers safe bets for lovely enhancements. Pansies Support Group, an independent breast cancer support group based in Hartlepool, has donated pounds 500 to the Middlesbrough HeadStrong service.